Adding a lip-sync to a project can really enhance its quality and storytelling. However, it can be difficult to shape a character's mouth to match the sound at a precise frame. 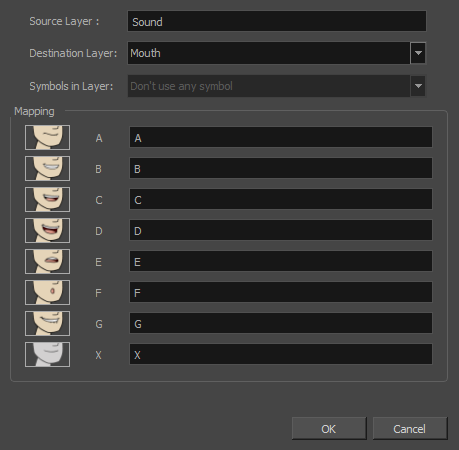 To solve this problem, Harmony provides a lip-sync feature which analyzes the contents of a sound element and generates a mouth chart (see below) based on the eight animation phonemes (A, B, C, D, E, F, G, and X for silence). 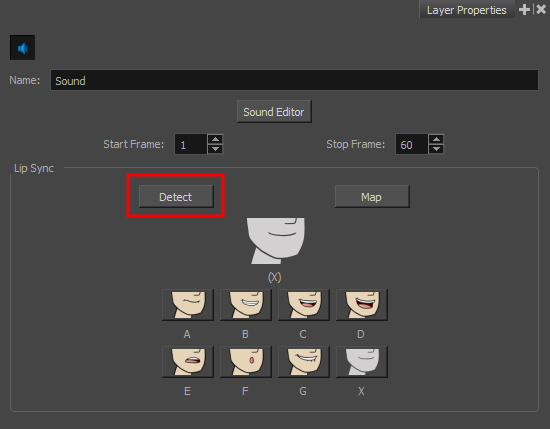 The mouth shapes used by Harmony are based on the conventional mouth chart used in the animation industry. NOTE: The letters used to represent the shapes do NOT correspond to an actual sound. NOTE: If you are doing cut-out animation, refer to the Cut-out Animation Guide, Character Building chapter, "Adding Extra Drawings" topic to learn how to add extra drawings to your character. You can lip-sync the traditional way or let the system automatically create the basic detection. 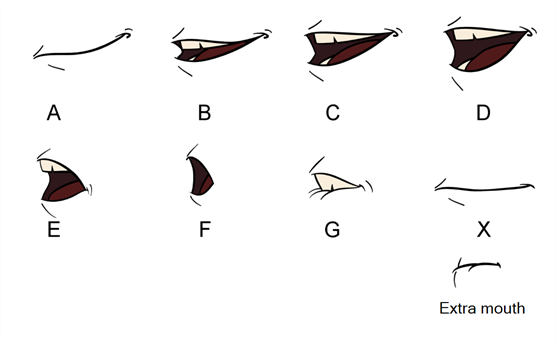 You can refer to the mouth chart positions as you draw the shape of the character's mouth. Press the Play button in the Playback toolbar to see and hear the results in the Camera view. To play back your scene with sound, enable the Sound button in the Playback toolbar.